What's it like to take your first family vacation in 10 years? AWESOME! 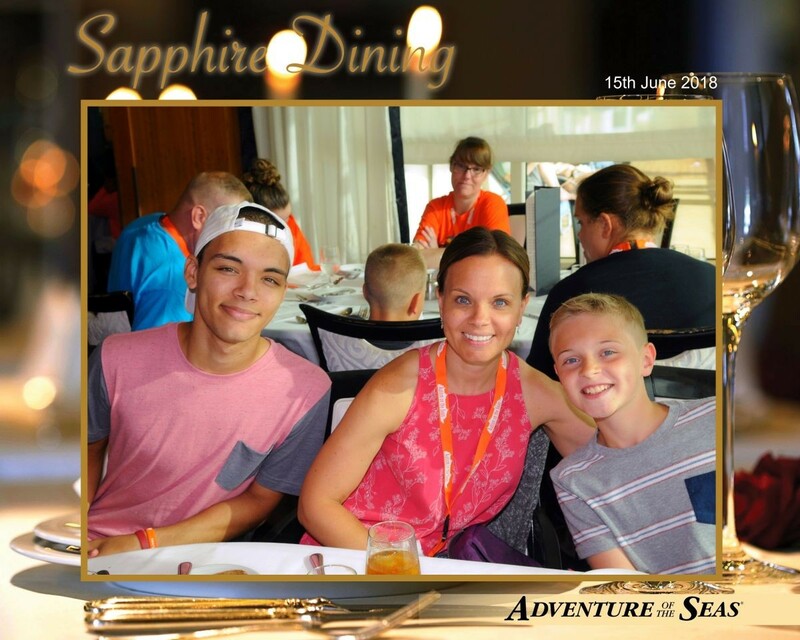 When typical families plan a vacation, their dreams transport them to picturesque destinations filled with excitement and new cultures, islands of adventure, serene tropical resorts, and cruises that offer something for everyone. In contrast, families with a child on the autism spectrum or other cognitive impairment, often don't dare to entertain their vacation dreams because they cannot overcome their fear of stress, meltdowns, embarrassment, and a host of other concerns. That's how Tiffany Meyers felt. Tiffany has a typical 17-year old son, Noah and a 10-year-old son, Aidan, who has autism and a number of stated phobias. Nevertheless, she was determined to take her family on their first vacation since Aidan was born. 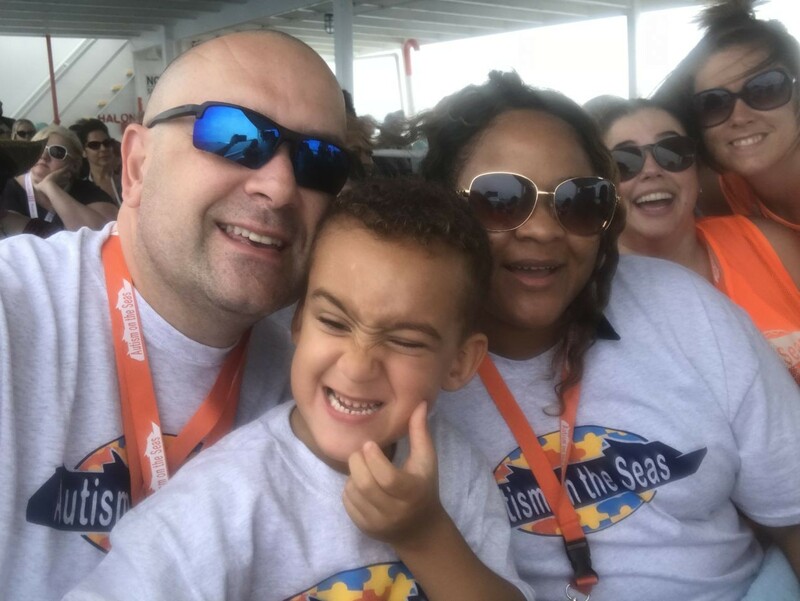 She found Autism on the Seas and booked the trip as a Christmas present for her sons. They sailed with us on a seven-night Royal Caribbean cruise to Nassau/Bahamas. Here's her story. 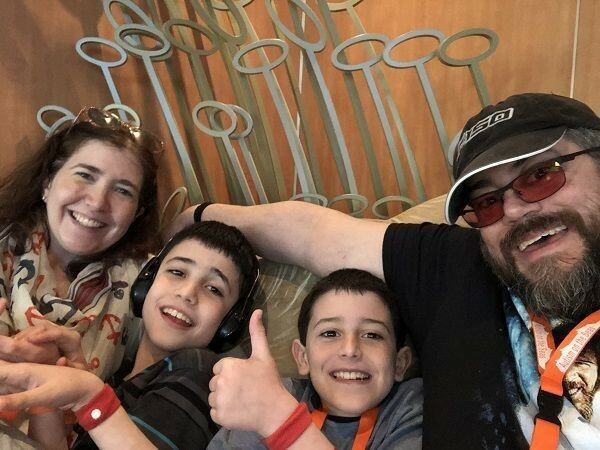 Autism on the Seas: Tell us a little bit about your cruise. Where did you go? Tiffany Meyers: We traveled from New Jersey and we went to Port Canaveral, Florida, first. From there we went to CocoCay, which is Royal Caribbean's private island and then we cruised over to Nassau. TM: So, when I found out in December that we were going to be able to take this trip, I was so excited. I thought the wait was going to be forever. Fast forward to June and the packing starts. I'm thinking this is wonderful, we're going on vacation. It wasn't until I got out of my friend's car, who brought us to the port, and I handed my luggage over to one of the gentlemen there, I looked up and I saw the ship... I can't even explain the emotions. It was this overwhelming fear. I looked up at the ship thinking, what did I do? I've gotten my family into this situation. What kind of mom am I? I cannot believe I'm doing this to them. I'm thinking, once we're on that ship, we can't get off. I was terrified, and I'm really trying to just contain my emotions and put on a happy face, but it was very, very, very hard. Once we proceeded to the front of the building, the first thing we saw were these bright orange balloons and a young lady standing there with her orange shirt. I knew who she was, and she knew who we were, and she came right over. And no kidding, within five minutes of meeting her, I was crying. AotS: What were some of the issues that you were most fearful of associated with your son? What has stopped you from taking a vacation for all these years? TM: Well, for one, to take an actual vacation away from New Jersey on an airplane is impossible. My son has a lot of anxiety and stated phobias about flying, so we just knew traveling by air was not going to happen. I thought, where could we possibly go to besides the Jersey shore that would count as an actual vacation? When I found out that Autism on the Seas ports in New Jersey, it's only an hour drive from us. We didn't need to fly! So, removing the airline out of it for us was humongous. 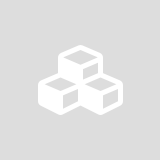 My son's a really big homebody, and he likes to be in a very familiar place, all of his familiar surroundings, his items, the people he knows. He's very comfortable there. So for him to step outside of that comfort zone was scary for us. But I can tell you what really prepared us taking Autism on the Seas/Royal Caribbean ship tour last March. One of the staff members was there during our tour and then traveled with us. She said she saw a huge difference in Aidan because we were able to take pictures, we were able to visit the state rooms, we were able to actually enjoy a meal. He was really able to see exactly what we were going to be doing rather than me just telling him. That made a huge difference in itself. Then leading up to travel, we received the social stories, and I went over them with Aidan continuously. So, the preparation up to the trip was huge for us, because for him, he's very visual. He's a very visual learner. It was like the building blocks to our trip, that's really what made it successful for us. AotS: At that point did you ask Aidan if he was ready to do this? TM: I can tell you, Christmas morning, I planned to surprise them. I printed out a sign of what we were going to do and I said, we're taking our first family vacation! I was awaiting an adorable response, but instead, I got, "I hope we're not going on the Titanic." So, I'm thinking, oh my goodness, that's not the response I wanted. I don't think it actually connected with Aidan what we were doing until we got to tour the ship with AotS' Seas for Autism program, and he could see exactly what was going to happen and what the ship was like, etc. AotS: So you actually booked it, and then you did the ship cruise? TM: Yes, so we were in, we had made the commitment in December, and then in March we found out we could tour the ship. I was anxious, so I contacted AotS to explain that my son has a lot of anxiety and fear. He wasn't understanding what we were going to be doing. That's when they booked us on the next ship tour. It was a huge, huge help for him. For us, for all of us. AotS: Okay, here we are, day one, how was Aidan when he boarded the ship? TM: The morning of our trip, Aiden was sick. He was worried about friends he would be leaving behind, and the connection just wasn't there. Are we returning? What are we doing? Why are my things in a suitcase? He didn't understand. Boarding the ship was just overwhelming for me because, I'm used to watching him and trying to focus on the person I'm speaking to and you know, your life is like a whirlwind when you're trying to watch a child who has special needs. So, Allie from Autism on the Seas was with us the entire process, and she just kept reassuring me, "I have him. I have him." So you do what you need to do. And I thought, this is crazy. I have help. Even the lady that checked in my baggage at the end of it asked if she could give me a hug. And I'm like, "Yes!" She could see I was just totally overwrought. So, we get onto the ship, and Aidan didn't want to eat, so we went into a private room, which was awesome. The staff suggested that Aidan try and call up one of his friends that he's struggling with leaving. So he did and then they said to him, "Hey, how about when we stop at one of the ports you could buy your friend a little gift? Would that help you? And he was like, "Yeah." I couldn't even think at that point. The staff was doing the thinking for me. Then, he didn't want to eat and I was nervous. Allie said, "You go and you grab something to eat and I'll stay here with him." During that time, she was able to convince Aidan, "Just put a little something in your belly, 'cause the ship's going to be moving, and we want to make sure that you're okay." With that, he began to trust her quite quickly, which was awesome and he's not a very trusting person upfront. So right from the very beginning, I knew that we were going to be very well supported. AotS: Did you notice any changes in Aidan as result of the trip? Did he do anything different or did he take risks that he might not have before? TM: I can tell you prior to the cruise, I was showing him things on the Royal Caribbean website of all the things we could do, and he was like, nope, I'm not doing it. No, no, no. The way that Autism on the Seas supports you in that we had private sessions for different activities was incredibly effective. The one big thing that Aidan conquered was the Flowrider. He was like, no, but he did it and he did it with a bunch of girls in orange shirts cheering him on. It was so exciting because they would cry. I would cry because he was doing all of these different things -- Flowrider and he also scaled the rock climbing wall. We actually had a private time for the water slide, and he sat at the top of the slide for a good 30 minutes saying, he just didn't understand what he was going to be doing, where it would lead him to, and he had overwhelming emotions. The staff was up there with him, talking him through things, telling him it's going to be okay. Finally, we said, if you do this, we'll put it on YouTube and that was it. He finally did it and once he started doing it, he kept doing it. It was overwhelming. He tried a lot of different things, and he's made friendships, which is the biggest thing. AotS: So he's keeping in contact with some of the kids that he met on the ship? TM: Absolutely. At the end, he was really struggling. We made a little yearbook for him and his friends, and even the staff put their phone numbers on there. And really, what helped ease him back into life at home, was being able to keep in contact with the people that we met. So we're only, not even a week off the ship, and it's been rough, I will tell you, to get back into life. The last night he was on the ship he was crying. He didn't want to leave. But the staff was so great. They made a visual schedule for him once he started struggling with, "what am I doing?" "What's next?" "When am I leaving?" And after a conversation with our group leader, she's like, "here's a visual schedule. It shows what we're doing each day and the activity. Hang it in your room. Here's an extra copy in case you lose it." I was like, "Wow." Every little aspect of our trip where he struggled, they stepped right in. You can't fail taking this trip. You just can't. AotS: All right, let's talk about you because I'm sure you needed a vacation too. Did you take advantage of the respite at all? TM: I did. And the funny thing is, I remember booking and I was like, I'm not even going to need it, you know? We're going to be so happy to be on vacation, but the staff was like,"Yeah, try it out, check it out and see what you think." I dropped them off and one of the other families that were traveling with us said to come and meet them at the lounge. I thought, okay. So I sat down and they suggested we get a drink. I thought, can I do that? I'm not used to doing that. I went and I got myself an adult beverage, which I don't even know what that is anymore. I sat down and we started chatting. That was probably the first time that I felt relaxed during the trip because I was with people that understood things and I could talk freely and not have to worry. So I did, I joined the other parents, a couple of the respite sessions. One respite session, I actually took my older son shopping, which we never get to do in a relaxed type of setting. And one night, I just sat on the deck and I had coffee and I watched the waves, and I kicked my feet up, and it was like, wow. To be able to relax and to know that Aidan was being cared for appropriately was huge. AotS: What about your older son? How did Noah fit into all this? TM: You know, for him, it's so hard because for years, he has taken a backseat to the world of autism. It's just what it is. We know that the siblings really are affected by it, but he's such a good kid. He doesn't get upset, he doesn't have any resentment towards his brother. He's the man of the house. When we got on the ship he said, "You know, this trip's about Aidan. Let's let him pick what he wants to do." I said, "No, this is your trip, too." Noah signed up for the teen program and from there, it was great for him. It was okay for him to go and have fun. He knew that Aidan was being cared for. He's being supported. So a little bit of worry came off of him. At dinner time, I could have a conversation with Noah and the staff was there to chat with Aidan. Normally, having a simple conversation with my older son can be such a challenge, because my younger one will do attention-seeking behaviors. It was little things. We reconnected. We really did. It was a great time for Noah, too. He made a lot of friends. He was also with the kids in our group, he was so great. He was like an extra set of hands for the staff too. So, it was great for him as well. I'm glad that he had that time. 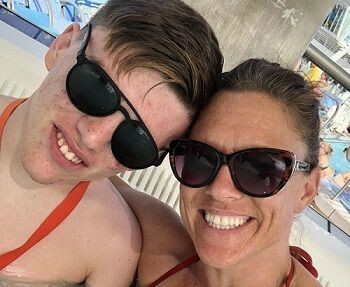 He reconnected with me, but also just kind of reconnected with life -- a life outside of autism. It was nice for him to get that. AotS: So, if you were to give advice to another family who wanted and needed this trip too, but they were still really scared to do it, what would you tell them? TM: Do it. I'm telling you, do it. I was scared, I think, probably like a week before my trip, I was ready to bag it because my fears were through the roof. It was really bad. I mean, it was bad. You can ask the staff from Autism on the Seas, they said the trip "changed you as a person." It really did. They saw a change in me quickly in the beginning. There's a Facebook page where you can actually talk with families that have already taken an AotS cruise. And there's just questions after questions -- with answers. I had an overwhelming amount of questions that the Facebook group jumped in to answer and offer help. That definitely helped. Like I said, touring the ship, the social stories...failing's not an option, and the staff is there to ensure that you have a successful and a relaxing vacation. I can't speak more positive words about this organization. I will support it until the day I die. I mean, honestly. We're just so excited to know, and we knew going into this, it was either make us or break us. We're either going to be able to travel in the future or we're not. So I think that there was a lot of pressure on ourselves to know this is it. It was an overwhelming feeling by day four when I realized we could end this trip and we could take another vacation! It opened up a whole new world for us, it really did. AotS: I can't thank you enough for sharing your beautiful story and your vacation with us, and I know that other people are going to love to hear everything that you've said, and they're going to relate to so much of what you're feeling and what you've been through. And coming out of it feeling awesome. Both your sons feeling great, and knowing, hey, I can do this again. I can be normal. I can go on vacation. TM: Oh, we would go tomorrow. If we could go back tomorrow, we would go back tomorrow. Trust me. We miss the staff immensely, and it hasn't even been a week. We miss the families and we just miss everything about it. We're just super excited to be able to go in the future.